What’s a soap-making party you ask? Students get to make soap and use all the teachers’ products and pay for the soap you carry home by the pound. As soon as I got the invite I was all in; as I had too much fun at the soap-making workshop to pass it up. There were a must for the soap making party: anything culinary related and of course skulls. 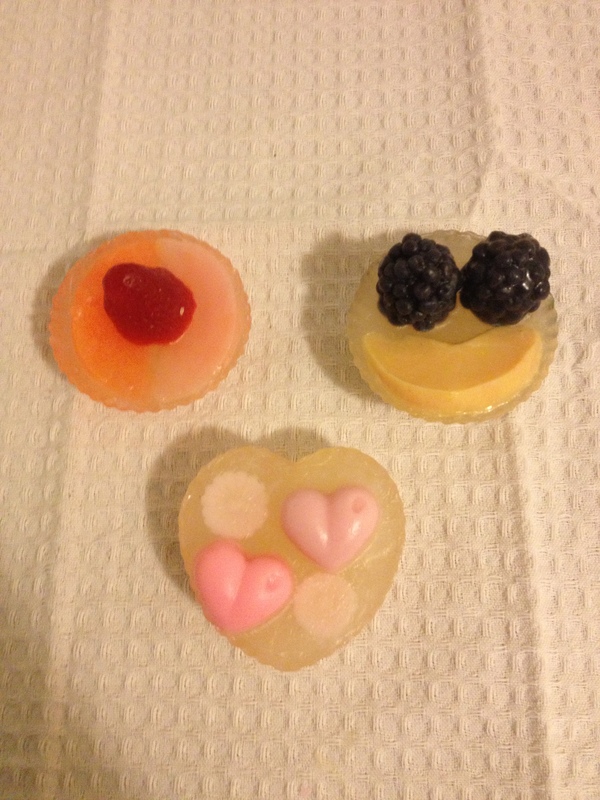 So I sat down and got to work and made my soaps and to us girls there it was fun play time. 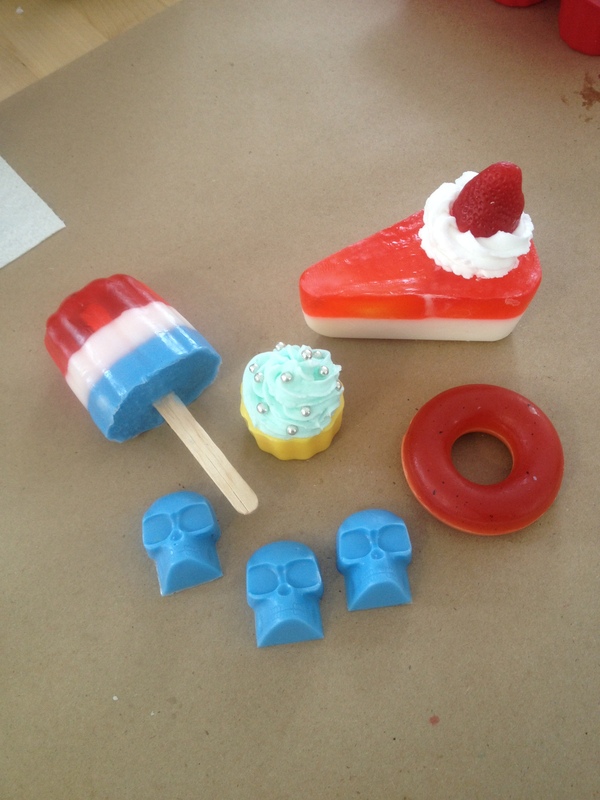 This day I made three soap skulls, a strawberry chocolate doughnut, Margarita Chapman’s Rocket (Chapman’s Rockets are my favourite Popsicle from my childhood), strawberry smoothie Jello pie with hidden fruit inside and lastly a peach mango mini cupcake with soap buttercream and pearls. 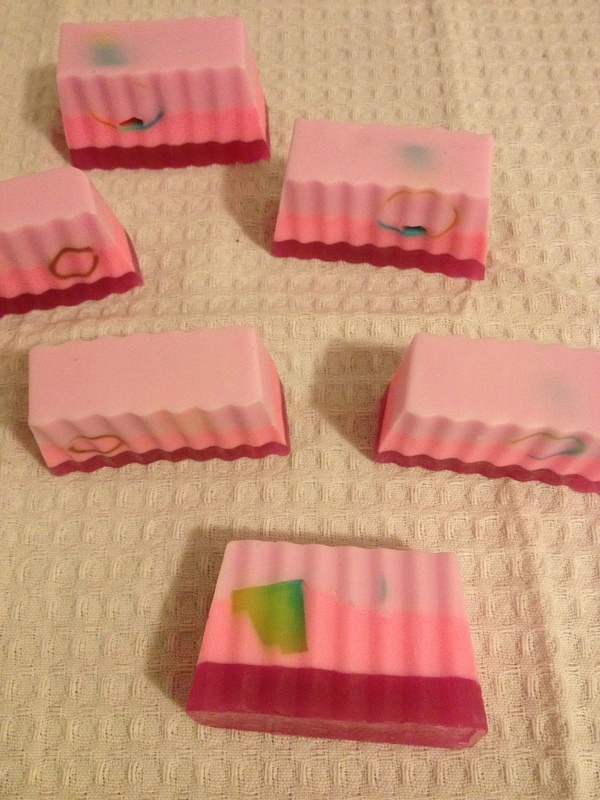 I feel quite Zen-like with I am creating soaps. This seems to be my happy place, where I can be creative and have fun. There’s no rushing soap-making, things need time to set and I like that, and I am therefore forced to slow down and relax, as this isn’t my way normally. Today was my second attempt using a proper piping bag and this time it was piping buttercream soap onto a soap cupcake, and it turned out quite well. A fun time was had by all, and I left a couple of ladies still creating more soaps and mixing colours. I’m the type of person who get super antsy, meaning I am constantly changing my hair highlights and style; or I get that feeling that I just need to try something new whether it’s revamping my wardrobe or switching up my go to meals. I love the one of a kind show and have been visiting twice a year for almost 10 years now. These artisans have so much creativity and every time I go to the show I think about how much I’d love to do this if I had the guts. I am addicted to handmade soaps from Demo Soap; so much so that when the owner, Thomas sees me coming he tells the associate to open a big bag as I’m stocking piling enough for a year. 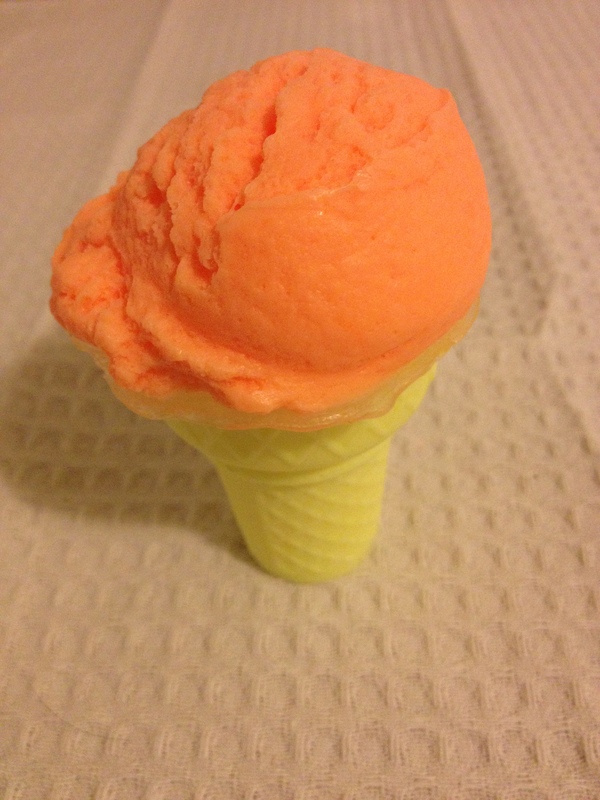 When I first started going to this show there was maybe two homemade soap artisans, but now everyone is doing it, soaps, body care, lotions and scrubs; and I have even tried it here at Candy Coated Culinista. Consumers are into natural and organic products so much more now than 10 years ago, and I thought I need to learn how to make my own soap. I will never stop buying soap from Thomas but making my own for presents and testing and satiating my crafty appetite is in need. I went to a workshop by Mellemee Soap & Cosmetics Crafts and learned how to make soap. In the two hour workshop I made: Layered Hawaiian Plumeria, Mango Madness & Pineapple soap with shredded soap and soap nibs; Green apple Glycerin Jello moulds with shredded soap and soap nibs, a Green Tea & White Pear Glycerin fruit tarts and heart tarts and finally Chocolate Ice Cream Cone. I didn’t expect to leave with the amount I did, but I learned a new technique, and I had a chance to be creative. 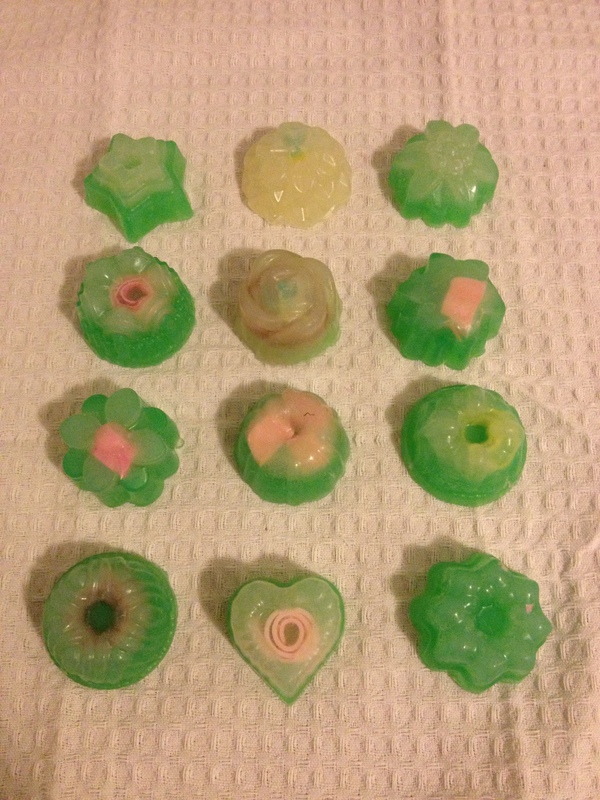 Homemade soaps are more organic than mass-produced soaps which I why I swear by Demo Soap. It’s gentle, doesn’t stripe away my skins natural moisture and my skin thanks me for that. After this class I was bitten by the soap-making bug and have been amassing the supplies I need to make my own soap. My teacher said I was very good and creative which made me very happy. I am saving my soaps I made in class even though my teacher said I must use them. To me they are too cute to use and I like to have the memories of my first attempt at a new skill. I don’t want my first works going down the drain quite literally as I worked hard and put al lot of creativity into it. My thoughts Overall this was a lot of fun and well worth the money. I will definitely do this again. Even when I become proficient I will always go back to learn something new techniques.